Provides label management services including label storage, approval, security, and history. 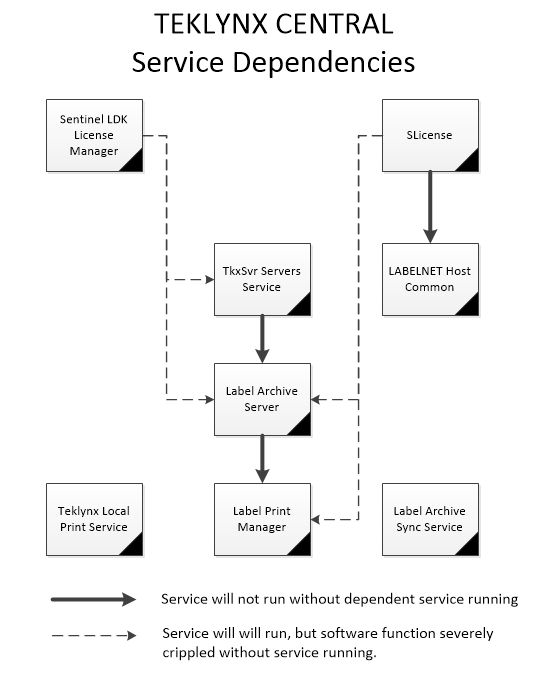 Label Print Manager, AKA SENTINEL. All server based printing runs through this service. Support SENTINEL UI. Forces update to browser based databases of key system changes. Software provided by SENTINEL LDK (not related to TEKLYNX SENTINEL software). TEKLYNX installs this this third party software to provide software protection against piracy. It allows software activation via USB key, software, or cloud. Without it, Print Manager (AKA SENTINEL) and Label Manager (AKA LABEL ARCHIVE) will not function. TKI Network License Service, keeps track of user/printer counts provided by the license. Without it, anything requiring user or printer licenses will not work. Manages local printing in the scope of TEKLYNX CENTRAL. This is the feature that allows you to print from the browser direct to a driver on your local workstation (often used to print to ports NOT on the network…LPT1, Serial, USB, etc.). TkxSvr Servers Service. Runs core services for TEKLYNX CENTRAL including UMSS.